Rahul Jain applied for a job as a Business Developer in a reputed MNC – Pentagon. The vast interviewing process included submitting a video resume, which was pretty new to him. Though this seemed to be a new activity – the challenge was to make an interesting video of him talking about his achievement for a good 2 minutes. After researching and practising on how to make a profile video, Rahul, a graduate, created a video CV, which fetched him his desired job. So, what is this video resume? A video resume or a video cv, is basically a short video with a length of about 2 or 3 minutes. Usually, these videos are created by candidates who are looking out for a job; the video cv is either uploaded on the Internet or emailed to the recruiting manager to review for further interview process. Video resumes or visumes, as they are popularly known as have taken the centre-stage. They have become trend-setters in the job market, which is catching up with fresh graduates and the employers; the concept of video resumes makes their work simpler and helps them to understand the applicant better. A video resume, as we earlier discussed is an add-on to the print resume in which the candidate can describe his/her skills and experience, thus, helping them to create an impact on the recruiter by marketing themselves. However, it is imperative to note that visumes are not a one-stop solution to fetch a job, but a bridge that connects the candidate and employer. 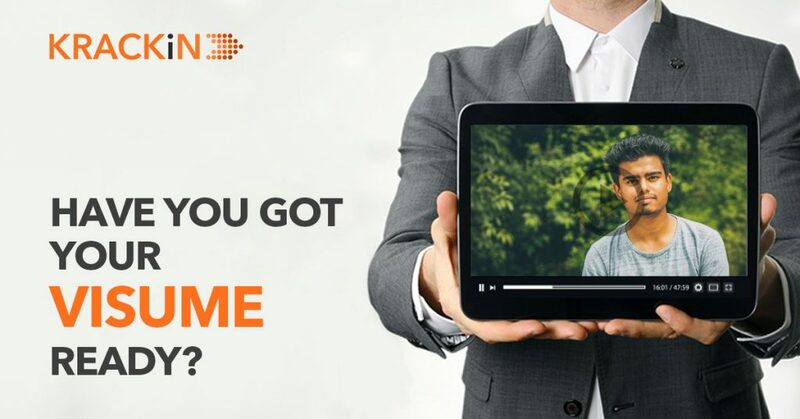 Having said that, the profile section in KRACKiN – The Digital Engagement Platform, is equipped with video resume, where students can upload their personal video cvs, which will help them in their job searching journey in the future. Recruitment is a tiring and lengthy process, the managers do not wish to sit through a long visume. Hence, it is always better to keep it short, as the recruiters will only use the video cv as an initial step to process the applicants. Any vague visumes will be rejected instantly. Being precise and appropriate to the topic will enhance the chance of getting through the interview. A lot can be done in a 2-minute visume by adding visuals and speaking about talents and skills. Hence, keeping it brief and to the point work wonders. As stated in the above point, visuals not only makes the visume simpler but will also add to the creativity. The technique of using the lights, brilliant editing and a dash of humour will be a plus point to the candidate. Visume is different from the print resume – most fresher’s go wrong while making a video resume. The purpose of a visume is to present the employer a deeper insight of the candidate. As opposed to the resume, which deals with achievements and academic details, visumes are more of explaining the recruiter of what the candidate is capable of contributing to the organisation in the future. Be professional: It is always better to dress professionally while making a visume, this also includes the use of words and body language. The other element to be noted is the background shots as well as the noises which could be distracting to the employer. Filming in casuals: In order to make the best impression, the candidate should avoid being dressed in a casual manner. Get a feedback: Feedback is another important factor of a visume. Getting feedback from peers helps in the necessary changes. Don’t read the script: Merely reading out the academic achievements or experience will not help. It is always better to keep the viewer engaged rather than merely reading it out like a script. Visibility matters: Visibility here refers to ‘core information’ presented in the video. That is, considering that the recruiting employers are generally busy, it is recommended that the video should be short and informative. Boasting achievements: Instead of bragging about the achievements, it is always recommended to speak about the skills and experience in order to be noticed. Quality equipment: Using mobile phones or any cameras with less quality can hinder the quality of the video. Hence, using a good mic and camera is very important. Don’t speak about personal life: Since the visume is limited to a minute or so, it is always better not to speak about personal life. Next story Should I Go for a Job or PG Course after my Graduation?